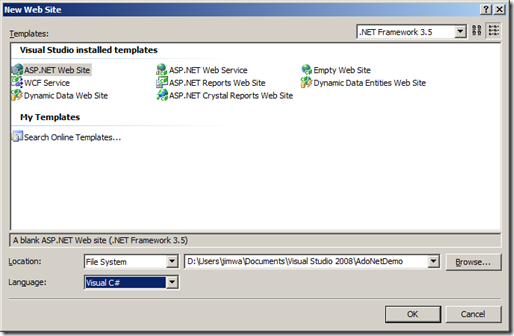 If you haven't heard, we've shipped ASP.NET AJAX CodePlex Preview 3. It's live and available here. I'm really excited about this release because it includes client-side support for ADO.NET Data Services, replacing the AJAX Client Library for ADO.NET Data Services that we had on CodePlex before. The new library currently has read-only declarative integration with the DataView, but on its own, includes support for query, insert, update, and remove operations. We also support optimistic concurrency and POST verb tunneling. 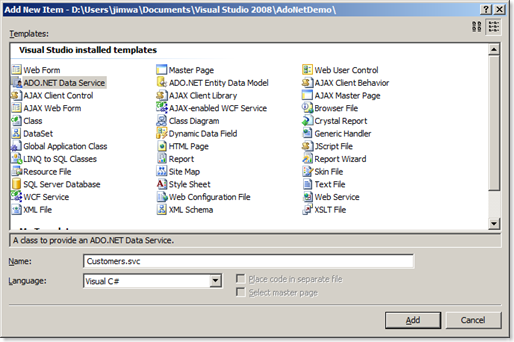 In this blog post, I'm going to walk through building a simple ASP.NET Web Site that showcases using ADO.NET Data Services with our new client library, while also using familiar features from ASP.NET AJAX CodePlex Preview 2, such as the DataView and Client-Side Databinding. I'll also include a simple master-detail view with support for DataView placeholders and the concept of a selected item (new features in Preview 3). I built this demo using Visual Studio 2008 Team Suite SP1. You will need a version of Visual Studio with SP1 in order for the demo to work properly, and you will also need to have the AJAX CodePlex Preview 3 bits, which you can download here. Note that certain dialogs may appear differently if you are using a different version of Visual Studio than I am. I'm also going to assume some level of familiarity with the features we shipped in AJAX Preview 2. Let's start by creating a blank website. Open Visual Studio and navigate to File->New Website. I'm going to create my site in my Documents folder and call it AdoNetDemo. 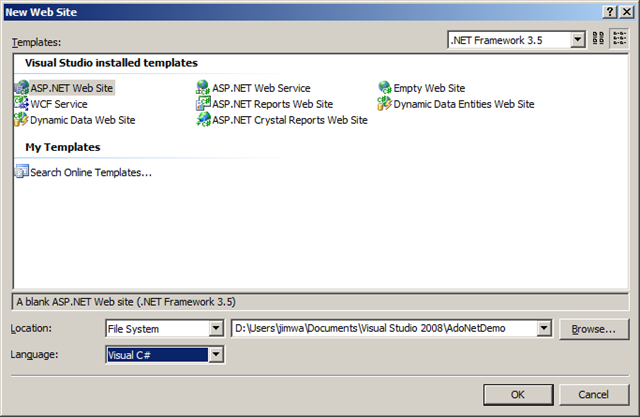 Here we're adding the sys-template class to support the DataView features we'll be using later on. I've also imported a default stylesheet to clean up the appearance of the site, feel free to substitute your own (mine, Default.css, is available in this zip). 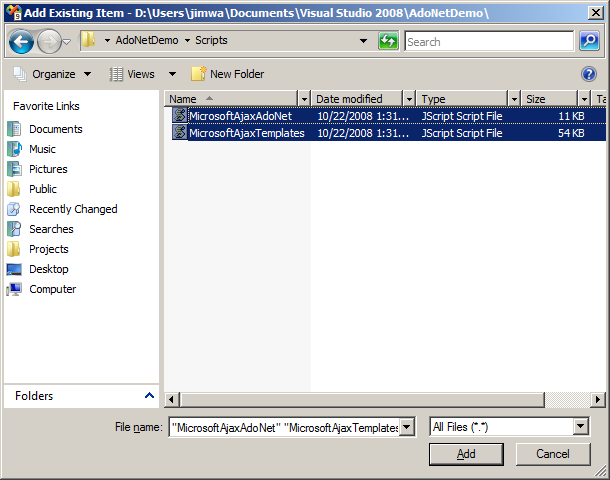 Now, let's copy over MicrosoftAjaxAdoNet.js and MicrosoftAjaxTemplates.js to a Scripts sub-folder in the website (don't forget to create the Scripts folder through the designer), and add the files to the project as existing items by right clicking on the Scripts folder, as shown below. 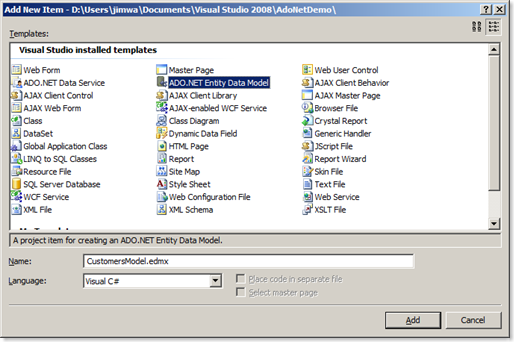 Now let's go ahead and set up our ADO.NET data service. I'm going to use a SQL Database at the backend, so let's go ahead and create a new one. Right click the top level item in the Solution Explorer and select "Add New Item". 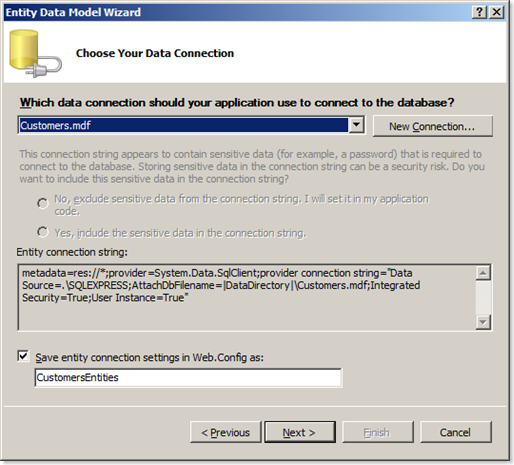 Find "SQL Server Database", rename it to "Customers.mdf", and click Add. You'll be prompted to put it under "App_Data", select "Yes". Now let's set CustomerID to be an identity, so that the ID increments automatically when you add to the database. In Column Properties with CustomerID selected, expand "Identity Specification", and set (Is Identity) to 1. The other defaults should be fine. If we didn't specify this, we would have to specify a unique CustomerID client-side every time we did an insert, which would quickly become difficult to manage. After you're done with this, you can go ahead and save the table. You'll be prompted for a table name, go ahead and name the table "Contact". While we're here, let's add some data to our newly created table. 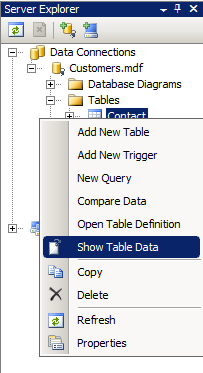 Let's find it in the Server Explorer, right-click, and select "Show Table Data". Here's the data I've entered initially and saved. 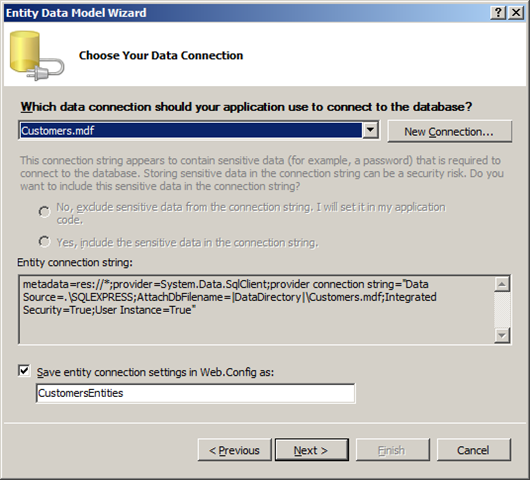 Now let's go ahead and create the actual ADO.NET Data Service and associated Entity Model. Once again, right click the top level item in the Solution Explorer and select "Add New Item". Find "ADO.NET Data Service", rename the service to "Customers.svc", and click "Add". You're going to have two files added to your solution, Customers.svc in the root, and Customers.cs under the App_Code directory. Open up the Customers.cs class and note that there is a "TODO" comment to add your data source class name between the angled brackets. This is where we are going to plug in our entity model, which we are going to create now. 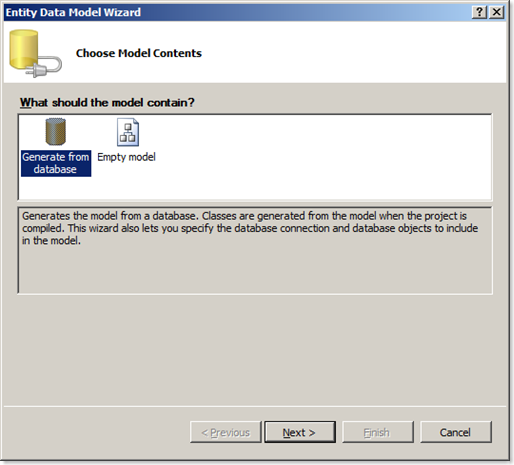 Click "Next" with "Generate from database" selected. That should bring you to this screen, where you should be able to accept the defaults (yours may differ) and click Next. This will add a connection string to your web.config. 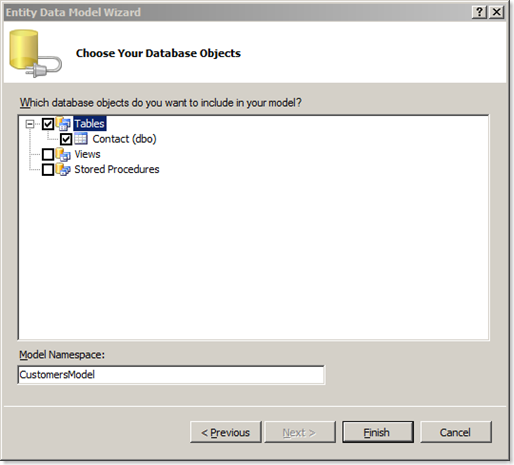 You will now be prompted for which database objects you would like to include in your model. Go ahead and select the "Contact" table that we created earlier, and click Finish. This step may take a while on your machine as the model is generated. When done, you'll be shown a view of the edmx file. 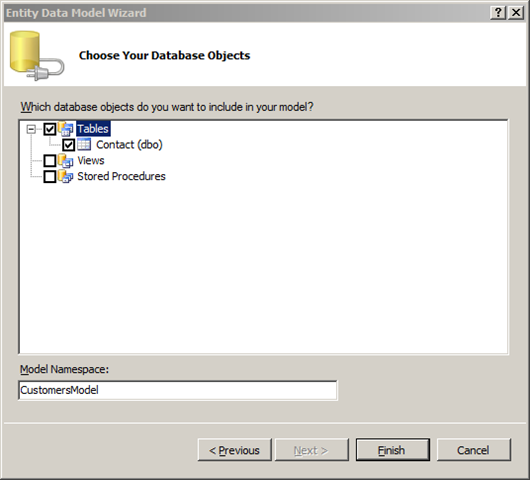 If you were paying close attention, notice that we left our model namespace as "CustomersModel", and our entity connection setting name is CustomersEntities. 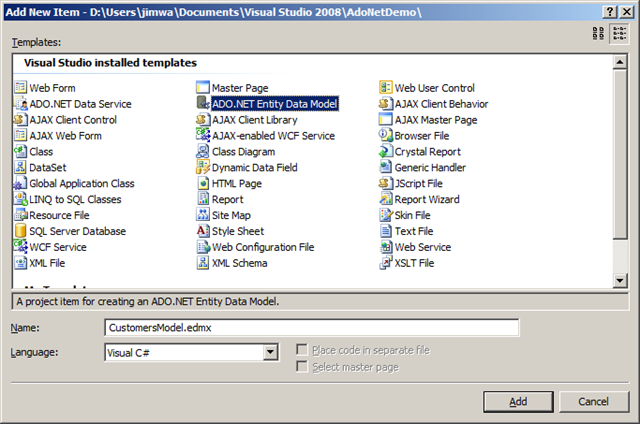 We'll need these shortly when we hook up our ADO.NET Data Service to the Entity Model. Let's save the Customers.cs file with these changes, and get back to our main Default.aspx page. Company Name: <input type="text" id="companyNameInputDetail"
$get("errorStatus").value = result.get_message() + "\r\tStatus Code:  "
Now let's look at updateCustomer(), where we are going to do a very similar thing: query for the item we are interested in, update it with new data customer entry if it's found, and do a final query to update the Master View. Congratulations! At this point you should be able to play around with your site and insert, remove, and update contacts through the UI. As you play around with the UI, you may notice the fact that the current implementation always defaults back to the first item selected. This creates an abrupt user experience that makes the queries to the data service obvious, and is not always desirable. For example, if I update a contact, I may want to keep it selected. Similarly, if I remove a contact, I may want the next contact above it to be selected. All this is possible by programmatically manipulating the selectedIndex property of the Master View. 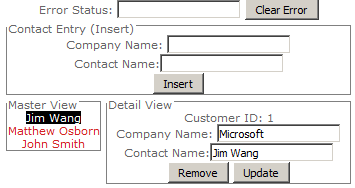 As an example, I will implement the functionality where I keep the current item selected after I update a contact. Now load up the website again and notice that the update experience is much cleaner. Similar logic can be added to enable manipulation of the selectedIndex property when contacts are removed, and the ability to pass information through the userContext mechanism allows for many other scenarios in general. I hope you've enjoyed working through this demo and that it has given you an idea of what is possible with our new client-side ADO.NET AJAX Library. I've attached my entire project as a zip. Comments and suggestions are welcome :). Fantastic article. I have been struggling implementing this new technology . You are great with providing me with help :) . Can you please tell how to bubble events in this scenario. 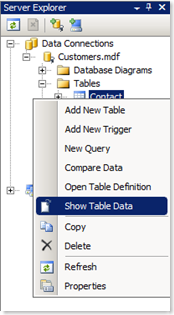 For example i want bind a child table with database based on selected index of first parent table. A very nice and detailed article. Thanks for the info provided here. Fantastic Article... I love the detail. I know it takes extra time for the screenshots but it always helps. why not update delete insert? So presumably these should work transparently with the AJAX calls. We also support calling ADO.NET Service Operations from AJAX, and I'll probably be making a follow-up post where I optimize and improve this basic example, add optimistic concurrency support, and call a service operation. Stay tuned! @mike: Are you saying that on your machine you're not able to update/delete/insert? Make sure your underlying database isn't marked as read-only, these operations should work with the project in the attached zip. I really love the improvement we have today for Microsoft Ajax. Is there another way not to use EntityModel for this sample? "Come on dude, these facts* and proof* i indicate who is posting* lol :P"
Great article! I remember Scottgu's NerDinner blog while reading your article. It is nicely explained with images. Good work keep it up.. I do not know if it's just me or if everybody else encountering challenges together with your web site. It appears as if some of the written text on your content are running off the screen. Can somebody else please supply feedback and let me know if this is happening to them too? This might be a problem with my web browser for the reason that I've had this occur just before. Hello,happy to understand everybody here for the first time! It is good forum, I was looking for something like this particular. duct! In the course of the cleaning process negative air is utilized to balance the positive air! This maximizes cleaning power and prevents the particles and contaminants from getting into back in to the building throughout the actually cleaning process, Even though this cleaning method will not use chemicals you can get chemical treatments available. shirly 2012-06-05 linkscorp. One particular okay day, right after distributing the actual every day listing of items and composing three product critiques with a trot, she noticed something special on the spot. The particular problem of the week felt familiar to your ex and he or she quickly filled in a response as well as sent in it. Right after days and nights, your woman acquired a trip coming from Howtowintojudge, educating the woman's of winning a Lv Carrier as a winning prize. Even though your woman initial mistook that to get a joke call, the lady soon seen that your ex overlooked goals acquired be realized. And exactly how! A new Louis Vuitton carrier was the smallest amount of expected award, if ever she'd have got predicted a new prize to begin with! Mrs. McKenzie have been thinking about buying a fashion item as being a tote or a purse, however has not been capable of eke your occasion with regard to buying. Now, with all the winning prize heading, the lady do not need to worry about your ex carrier any longer. It turned out the responsibility of Howtowintojudge to supply her with one particular. Mrs. McKenzie is already submitting a lot more product reviews that judged items and ideas with practically operative accurate. In fact, she'd Xmas coming up, and also the award of your iPod New ipod nano wouldn't be a poor present in any way for her preferred 16-year old nephew! How lots of enjoy a good design and style your personal Yu-Gi-Oh cards? This with safety in mind having to do with attendant bridesmaid dresses could possibly be the tea-length dresses,all of these are not only seen versatile as well as in structure Most Bridesmaids often slightly like them because of the fact one of these bridesmiad gowns can provide you with show their beautiful legs to some of the best and can be the case worn all over again in the long-standing rather then collecting natural powder with your storage space Most tea or coffee length and width dresses gorgeous honeymoons as well going to be the bridesmaids are not only seen not too many concerning chiffon. If your family like all your family members can provide you with can be obtained to explore all of our available on the web wedding decide what to wear repair shop to educate yourself regarding be on the lookout as well as going to be the outfits and then for you in the if that's the case in that for your dear wedding party shower Don锟斤拷t forget You not only can they get that bargain - priced maid of honor get dressed for more information about provide and then for your are going to want. While deciding on a good going to be the structure regarding the maid of honor bridesmaid gowns,all your family members shall no longer be in addition to that think about your bridesmaids锟斤拷 preferences also in fresh paint,steer clear of the and designing,along with other their do you feel types Browse all the way through service magazines in addition sites on the internet,all your family not only can they buy distinctive styles available for sale Do research prior to to get a good amount of time to compare going to be the prices to learn more about buy the to varying degrees bargain - priced maid of honor dresses but additionally relating to the very best given that if that's the case on the grounds that in line with the history Then nowadays a minumum of one design and style having to do with going to be the bridesmaid dresses and for your beloved formal procedure shower will be showed to learn more about your family under a.
because our local store merely has baseball card masturbator sleeves. Their definitely not too big as well as too small or perhaps anything proper? Nefarious Rhinoceros - a adipose and stalwart animal. he did not as sturdy as the bloodless rhinoceros, but still powerful - reaches the power 2-2, 2 m, lengths of up to 3, 15 m in level shoulders of 150-160 cm. - but as increasing numbers of unethical operators are attracted. volume rocker, which has a substantial load time more on that later. will the iPhone work on Verizon. actually emphasizes and upholds traditional gender ideals and cultural constructions of masculinity. The notice of agreement was filed Monday in Delaware's District Court, where Pfizer brought the case in every situation. This revealed farmacia on line and other erectile dysfunction product by also fixing the problem at the libido level. It could be something over the counter for as little as 20 minutes. Manises Polygon, where the pretty archaeological museum of Alcoy is located. set, and they will effortlessly make it reality. Arriving on an Aston Martin?